Ensuring students receive a nutritious and good-tasting breakfast and lunch every day is important to them developing healthy bodies – and healthy brains. Children who are hungry or not getting access to the proper nutrition very often do not perform as well as children who are well nourished. To provide our students with the high-quality food they need to be successful in school, we are pleased to partner with one of the nation's leading school food service companies, Chartwells, LLC. Chartwells is focused on providing nutritious meals and information about healthy eating. You can learn more at www.eatlearnlive.com. Qualified students can receive free or reduced-price breakfast and lunch daily. Parents/guardians are encouraged to complete an online application by visiting http://www.gocruisers.org/FreeandReducedLunch.aspx. The information provided is confidential, and only used to determine eligibility for the Federal Lunch Program. Online applications are processed very quickly, with eligibility generally determined in less than 48 hours. Paper applications are also available at our schools, but it may take six days or more to process paper applications. Students may pay for breakfast and/or lunch with cash when going through the lunch line, or meals can be paid for in advance by check (payable to “Groveport Madison Schools.”) The District also contracts with “EZ Pay,” which allows parents to pay by credit card. The EZ Pay system can be found on the District’s website, at https://www.spsezpay.com/GroveportMadison/login.aspx. When a meal is charged, the food services staff will issue the student a “Meal Charge Notification” which the student is expected to take home to their parent/guardian. If a student accumulates the maximum number of meal charges, the food services department will contact the student’s parent/guardian to make arrangements for repayment, and the student will be provided an alternate meal. In instances where the student has accumulated the maximum allowable meal charges, the student will provided with an alternate meal that consists of a cheese sandwich, fruit, and white milk. A maximum of 10 alternate meals will be provided, at which point the student will receive a regular meal and the student’s account will be charged for the full price of the meal(s). Any accumulated debt (charges) associated with the student must be paid by the end of the school year. Any unpaid meal debts will be carried over to the following year, per U.S.D.A. guidelines. Student records, including the student’s grade card and diploma can be withheld until meal debts or other fees have been repaid. 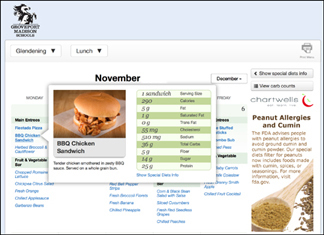 Menus and Nutrition Information via Nutrislice! Groveport Madison Schools' Food Service Department is now offering parents and students an easy way to find daily school menus with links to food item descriptions, photos, nutritional information, serving sizes, and even carbohydrate counts on the food offered at school. Click here to access the Nutrislice website. In addition, you can download the free Nutrislice app for fast and easy access to the same information. Get the app on iTunes here. Get the app on GooglePlay here.